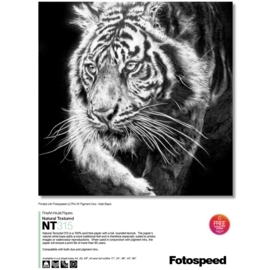 Fotospeed NATURAL TEXTURED 315gsm, is the sister paper to Fotospeed Natural Soft Textured. Whilst the weight is the same at 315gsm, the paper features a full textured matt surface making it ideal for replication of painted artwork, but also for adding an extra dimension to many photographic images. Photographers may find that the surface is especially suited to more abstract photographs and where images have been subjected to "lith" style or other treatments in post production.